I've just completed going through a new to me 7b. It was rescue I got in a barn sale. It had obviously not been used in possibly decades. After a thorough cleaning, a new start cap on the motor and a couple repairs to like the motor wiring, the tool post gib and the hub crank screw, and assorted stuck things, I was ready to make some chips. I did a couple of passes on some aluminum I had. The finish is the best I've ever been able to achieve with any of my machine tools. But up careful inspection on the surface plate I noticed there is a pattern. The first 1/4" of the pass is crazy flat like within .0002 then there's very slight chatter then from there on there is up to .004 total wander. Even though it's still like a mirror finish. Needless to say this is puzzling. As I was doing this I also started tightening up the gibs and rechecking. The one thing that I need to replace is the feed nut as it's definitely worn enough the internal threads are sharp, not good on a acme thread. I'm wondering if the table foot is the culprit of the sudden aberration? It was stuck in the up position before I went through it and the bottom of the foot and the surface has some long scrapes from chips or dirt stuck between the surfaces. Do you guys use the foot on your shapers? Thanks for your reply. Nice looking machine. In reading the manual I saw the layered shims for the ram. So it made sense when I pulled the ram and saw a loose one on each side. What kind of play should you have? There are no wear ridges on any of the ways. The stand it came on was I think an old teletype stand. It was made just to the length of the 4 hold down bolts so it should be supported all the way out to the foot. im also going to have check and do something with the foot and the surface it runs on as both are rough as a cob. I can see where the extra quick locks on the head gib make a lot of sense. Also some larger dials for the head and the cross feed are on the list after the feed nut and squaring away the stand and getting the foot and it's surface right. In talking to a guy who deals a lot of parts for 7b's he sees a lot of them modded. What other mod's have you done? Checking Connely's book, 0.oo1" to 0.0005" would be correct clearance if properly scraped. I use the foot all the time too. Sounds like good advice from all the above. I am looking forward to some of the mods that others have made also. Thanks Rob. I found that and dl'd all the shaper books when I was on the hunt for the correct starter cap for the motor. There are some interesting mod's like the one for a auto down feed for the cutter head. I got a chance to check the play on the ram and I had .005 with ram retracted and around .001 fully extended. I have some wear damage on the cutter end of the ram upper ways. I suspect it got run with some of the accumulated gunk on the upper way and I'm going to have to scrape in the upper ways and the retainers. The shims are kinda mangled and were not the same on both sides. I have some shim stock and will probably have to make new shims once I get things more squared away. I continue to cruise eBay for shims and maybe some will pop up. But I don't think making a set of shims will be that big a deal. Think you can get the layered shim stock from McMaster-Carr, although I used the plastic shim stock that I had on hand. As far as mods I did quite a few, first increased the oil channels on the ram ways, lengthened the horizontal ones and added vertical ones, made new sliding yoke block with oil ways to the yoke in a "v" pattern with a large resivour for oil, (I think that lack of proper lubrication is a big problem with these shapers) , surface ground or hand scraped all way surfaces, made new top slide screw/nut with ball bearings mounting and adjustable bigger dial , added locking screws for the top slide, added needle bearings on all trust surfaces and many more. I basically started with the castings and built a shaper without regard to building to a price, with is what Atlas did. Do you have any pics of the upgrades in progress and if not could you take some close up pics of the mods in place? Thanks frugalguido for some explanation. I know it's tough to show them in retrospect but I for one would be very interested if it's at all possible. Some of your descriptions I think I understand, but I'm new to shapers in general and this is my first in depth contact with one. I try to post some pictures when I find them of in process and will take some of exterior mods. I am thinking that it might be better to start my own thread on my 7B. I will also start a thread on my new idea that I have been studying up on, a appox. 1/6 size model of the Cincinnati XM-1 42" high speed shaper from the early 60's but with a twist, instead of gears and hydraulic clutches use AC servo's and CNC control which they didn't have in the 60's. Please do start another thread on your mod's. I look fwd to it! After getting the shims on the ram squared away and finding that there was actually an extra on one side, the clearance was around .0015. I took the time to install a couple of gib locks on the head like frugalguido and everything is now perfect. It's cutting smooth and totally square(!) with no more mystery chatter or wander. I think most of the problem was not having the head gibs cranked down. But with the locks I don't have to run them so tight until I get ready to cut which I think is easier on the screw and nut. For me the hardest part is remembering to tighten all the different things back down after setup. Thanks for that suggestion frugalguido. on mine the moving jaw of the vise lifts a LOT. I need to address that. Nice to see the other suggestions regarding oil groves etc. First I am going to build a base, then I will look at the machine in detail. One thing I will rig up is a micro switch going to a relay to shut the machine off at the end of a pass so that I can do other work while it is doing a pass. Although for now I find myself staring at it while it runs - it is hypnotic. I was wondering if anybody has made an auto down feed for any of the smaller shapers that don't come with one. In one of the books in the archive there is a description of a down feed the author made for his Acorn. To me it seems overly complicated with the modded 100tooth gear and rack, linkage etc. To me it seemed like he didn't take advantage of the natural motion of the arm to index the downfeed directly and used it instead to power the rack gear setup. Personally I would go to electric/electronic in this day and age for any downfeed or any auto functions. It could open up a whole lot of possibilities. I am currently designing ( very early design stage, proof of concept) a CNC shaper that uses screw driven ram with auto tool post lifter (allows the use of carbide) and steppers on the table movements. Basically building a 1/5 scale model of the Cincinnati XM-1 using 2017 technology . Probably asking what the hell is that. It was the most advanced metal shaper ever built, but came about a little late in the game. Super high cutting speed, 400 ft/min. Used gears and hydraulics, I am going to try using electrics and electronics, just for a hobby and a learning experience. The Cincinnatti is a very impressive machine. What time frame is this? How many were made? Personally, electronics is not what I'm most adept at or comfortable with. I have a much simpler mechanism than the Acorn in mind, but was hoping others would post their mechanical solutions in case I was reinventing the wheel or had missed something obvious. I would be very interested in seeing your CNC shaper. On another thread Bob Korves quipped that somebody should come up with a CNC shaper. It would be interesting to see if it was simpler than the usual mechanical shaper. If you think it you can build it , seems man's always overcome the cants and he does. 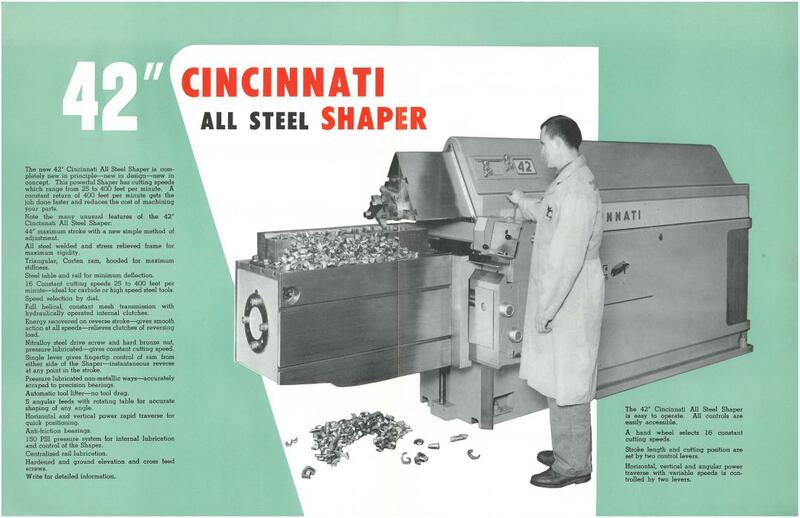 The Cincinnati was made in the late 50's and they made two as far as I know, One was shown at a machine trade show, probably to see how much interest there was. They did obtain a patent on it. Just to give you a idea how big it was, 13.5 feet long and weighed 14300 lbs, some metal there! On the atlas, the first thing that I would personally automate is the cross slide, before the downfeed. But, if you did the downfeed and wanted to keep it simple, I would use ratchet wheel and a solenoid on the down slide. Mount a micro switch on the back of the machine so that very time the ram is at the back most position it would fire the solenoid and increment the racket down a tooth or more. While an interesting exercise, the sheer size and weight of the machine would not appeal to any except the heaviest industry IMHO. I have never been ruled by need for speed in my work or play. My experience is there is a diminishing return on quality at the expense of speed. And trying to compete with a repeating single stroke machine against a rotary lathe or mill is a tall order if your intent is speed. But for me the shaper offers a unique package of small size, unique flexibility and cheap tooling. It turns out in its antiquated way the best finish of my machine tools but takes more thought, planning and skill for me to run it properly. I could probably learn to hand feed like Rudy K. did. But since I plan on replacing the silly little dials on the down and cross feed anyway, why not go the extra mile? I'm curious why you would change the cross feed as it already does an ok job as is? About the only electronics I'm contemplating is DRO's on the down and cross feeds. You obviously have the skills to do whatever you want in that dept.